Police: Driver Shot by Officers Told 911 Dispatcher "I Have a Gun"
A man who was shot and killed by police after leading officers on a brief pursuit on the 101 Freeway Wednesday night called 911 during the pursuit and told the dispatcher that he had a gun and planned to hurt police, according to a statement issued by the LAPD. During the 911 call, the driver said, "I have a gun," according to the statement. "If they pull their guns, I’m going to have to pull my gun out on them." Police on Thursday confirmed that the driver, identified as Abdul Arian by family members, did not have a weapon on his person when he was shot. 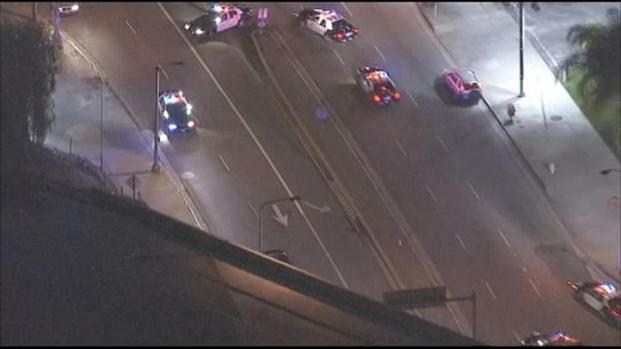 The lengthy 911 call occurred as the man led officers through the west San Fernando Valley before he stopped his car across two lanes on the eastbound 101 Freeway near Canoga Avenue. Police say a 911 call made by Abdul Arian reveals the 19-year-old indicated he was carrying a weapon. However, police say Arian was unarmed when officers shot and killed him Wednesday night on the 101 Freeway in Woodland Hills. Patrick Healy reports from LAPD headquarters in Downtown LA. The 19-year-old man ran from his vehicle and "took what appeared to be an aggressive shooting stance," police said. The subject pointed something -- his uncle told NBC4 that the object was a cell phone he had used to call 911 -- at officers as he backpedaled away from the car, and officers opened fire. 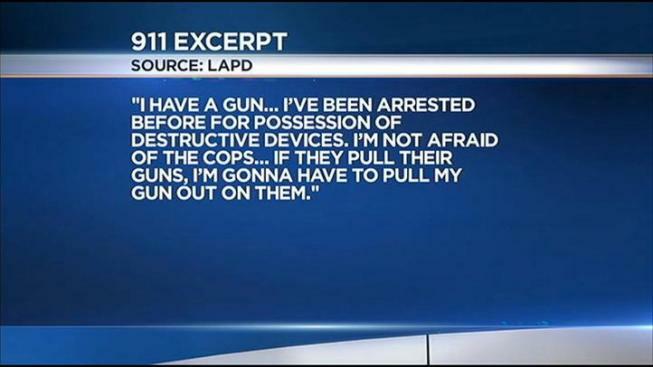 "This caused the officer at the scene to believe he was armed with a handgun," according to the LAPD statement. Video taken early Thursday (still image, below) showed what appears to be damage from bullets at an office building just off the freeway. 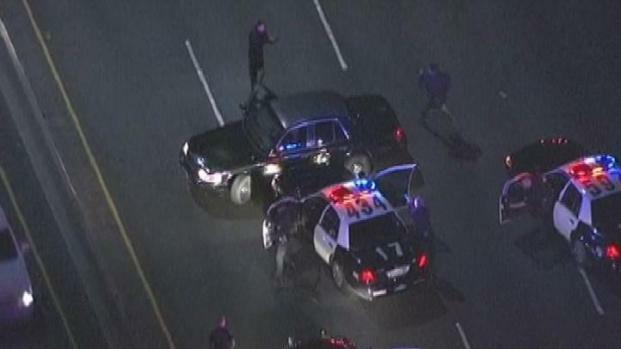 Police opened fire on the 101 Freeway in Woodland Hills after a pursuit suspect parked across two lanes and exited the vehicle pointing an object at officers. Alex Calder reports from News Chopper 4. A preliminary investigation indicates he did not have a gun, police said. "He was so afraid that he called 911 from the vehicle while he was being chased," his uncle, Hamed Arian, said. The dispatcher told the driver several times to stop the vehicle, but the driver responded, "I'm not going to get hurt s---head. F--- these police, they're going to get hurt," according to police. A police command unit, several squad cars and the pursuit vehicle remained at the shooting location Thursday morning. A coroner's van arrived at about 6:30 a.m. to remove the body. Officers began pursuing the vehicle after reports of reckless driving at about 10 p.m. Wednesday near Plummer Street and Shirley Avenue in Northridge after the driver fled from a traffic stop. "Our officers actually backed off... hoping the suspect would stop or slow down," said Lt. Andrew Neiman. "But he actually did the opposite and the officers had to re-engage for the public safety." Arian's Facebook page reveals a special interest in police. The cover photo at the top is a patrol car with lights on reflected from a rear view mirror. Another photo shows police cars parked at a curb. Arian's uncle says his nephew did not own a gun. However, a status update from Arian's Facebook page from a week ago says "just came back from the shooting range and got some blood on my hands." "I don't know what he meant by writing those things, but to me he was a very nice guy," his uncle said.